The Delaware Accordion Club. We usually bring and play our own accordions but we also enjoy trying other member’s accordions. 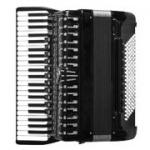 All levels of accordionists are encouraged to participate, and do, everything from beginners to professionals. There are no pressures, competitions, or particular requirements. You don’t have to play if you don’t feel like it, but after while, everyone usually wants to give it a whirl. Sometimes we even take turns playing back-up accordion. Near the end of the afternoon we might even jam a little.